You'll be £13.59 closer to your next £10.00 credit when you purchase Major & Mrs Holt's Definitive Battlefield Guide to the D-Day Normandy Landing Beaches. What's this? 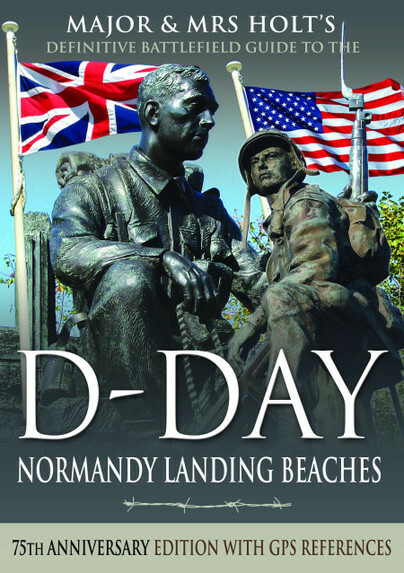 Already the best-selling English-language guide to the area, universally known as THE BIBLE, this is the 75th anniversary, completely revised, up-to-date, much expanded edition of the DEFINITIVE GUIDE TO THE D-DAY NORMANDY LANDING BEACHES. The third in the Holts' important series of Battlefield Guides (following the Somme and the Ypres Salient) it employs the same, highly acclaimed formula. Once again the cold facts are interlaced with anecdotes of bravery, humour, sadness and humanity. Packaged with the Battle Map of the Normandy Landing Beaches showing the sea Assault formations for UTAH, OMAHA, GOLD, JUNO and SWORD Beaches and the air Assault Formations round Ste M Eglise and Pegasus Bridge; the D-Day Objectives and the Ground Gained on D-Day. In time for the 75th anniversary of the Normandy Landings, a completely revised and much expanded edition of the book universally known as the Bible of battlefield guides.